On the back of that blurb and a brilliant marketing strategy from Orbit, Weeks' first trilogy was a huge hit (I'm sure it had something to do with it being good too). Since then, Weeks has been considered a rising star in the genre, further cemented by The Black Prism debuting at #23 on the New York Times Bestseller list. Despite Weeks' commercial success, I wasn't quite ready to coronate him one of the heirs apparent to the epic fantasists of the 1980's and 90's. I felt that, while a tremendous creator, he hadn't yet come into his own as a storyteller. 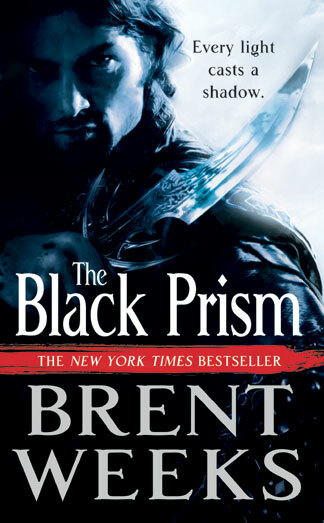 After finishing The Blinding Knife, his follow-up to Black Prism and the second installment in the Lightbringer series, I don't hesitate to grant him that status. His newest novel is a tremendous achievement and a logical next step for him as a writer. In the Lightbringer series, Weeks breathes life into a world that takes its cultural roots from the Mediterranean. Ruled by an alliance of the Seven Satrapies (one for each color) and bound together by the belief in a god of light, it's a government not dissimilar from the Holy Roman Empire. Like the Emperor and the Pope, the Satrapies are ostensibly ruled by the Prism and the White, a color drafter of unequaled power and a religious head of state, respectively. Weeks folds decades of history and context into this setting, a task that made Black Prism an occasionally cumbersome novel, including laying out color drafting, a magic system that converts light into matter. Nevertheless, Black Prism excelled. Beautifully drawn characters, particularly Kip, a fat adolescent thrust into events far outstripping his capability, carried the novel. Weeks twisted expectations with the typical hero archetypes failing more often than succeeding, and both sides of the conflict seemingly equally justified in their conviction. In that way, Blinding Knife is much the same as its predecessor. It picks up where Black Prism ended, telling the story of Gavin, Kip, Liv, and Karris, as well as a few new characters. Where Black Prism was a story about shortcomings -- Gavin's fear, Kip's insecurity, Liv's efficacy, and Karris' anger -- the new novel is about overcoming them. Additionally, politics become more prevalent as Gavin maneuvers in his nascent war against the color wights. Weeks is often at his best in these scenes, finding ways to generate passion from his reader even when the action ebbs. Recognizable throughout Weeks' work, is his use of short chapters, 115 in Blinding Knife. Despite their diminutive length, each chapter bristles with intent and never a word seems wasted. Freed from first novel world building, he uses these short bursts to layer narrative tension, releasing it and building it again, each time becoming more intense before finally bursting in a last two hundred pages that feels almost tantric in its never ending climax. The length of it risks the impact of those finals pages as my tolerance for denouement was equivalent to my tolerance for beer after four years at UC Santa Barbara. That isn't to say I wanted any less, but I fear Weeks packed so much in that I became inured to the sense of wonder he so carefully cultivated. Still, I would happily have read another two hundred pages without batting an eye. There were a few narrative hiccups that didn't work for me. Occasional first person asides, in particular, whose purpose became clearer as the novel concluded, but never coalesced as I'd hoped they would. I suspect on a second, and more careful reading, they'd be more illustrative. Either way, they did little to dampen my enjoyment of this otherwise pitch perfect novel. Two books in now I feel comfortable asserting that the Lightbringer series is about nothing less than taking the measure of a man (or woman). What makes him good? It is his intent or only his action? Does duty come before all or is there a moral certitude that must take precedence? And ultimately, is there a price too high to do what's right? It's riveting thematically, but more important it's indistinguishable from the story itself, blending and supporting it at every turn. I find it a testament to Weeks' talent that he succeeds in it so well. 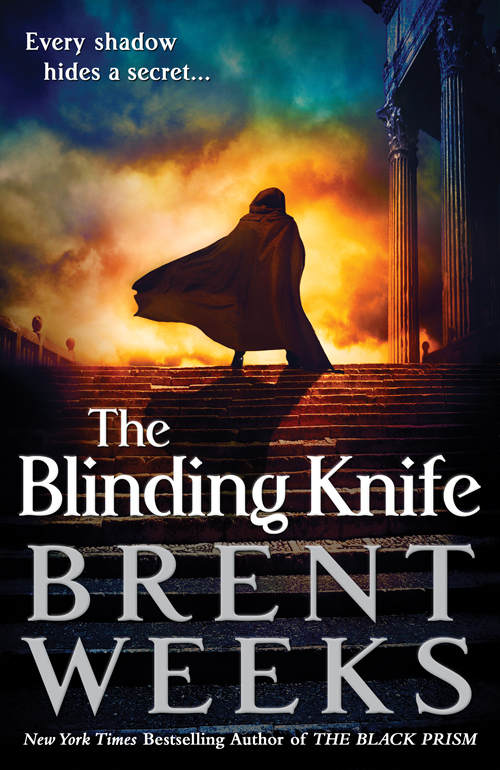 I've read all five of Brent Weeks' published novels and it's a certainty that he's evolving with every book. With The Blinding Knife, I believe he's entered a new stratosphere and one that puts him on par with anyone who's written these kinds of stories. It isn't only the best book he's written; I consider it one of the best epic fantasies I've read. Do me a favor and read it too. Whoa, how did you get your hands on a review copy of this? I think I will do you that favor, Justin. I'll need to pick up THE BLACK PRISM first since I didn't get through it initially. Too many readers whose opinions I trust and mirror my own keep nagging in my mind to revisit it. After all, I REALLY enjoyed THE NIGHT ANGEL trilogy. My soul is owned by several publishing demons. With all its flaws, I absolutely loved The Night Angel trilogy and been meaning to get to this one for a while. This review is excellent news. I agree with basically everything you've said. Great book. If it wasn't Brent Weeks I'd be upset that my idea of using light as a magic system was done better than I probably ever could. Excited to read it. Yeah, and I'm sure Brandon Sanderson in WARBREAKER would weigh in on the subject too. I enjoyed Night Angel, despite some flaws it was a good page turning action story. I have Black Prism,but haven't got around to reading it. I may have to rectify that.